This is french Heaven !!!! Speacially the lobster the beef the scallops!! Brillant taste which you normaly only in paris get! Explendid cuisine with special care on the mix of different flavors. The artichoke icecream stands now as one of the best desserts I ever experienced. We made a reservation on short notice, but they could not have been more gracious! The wine, food, and service were excellent. Lovely, quiet atmosphere (but the restaurant was not crowded), AMAZING bread, really special and delightful meal. A very cosy restaurant in a cosy part of the very centre of the old Copenhagen. The food is delicious, beautiful and a bit experimental in a positive way. In short, a very pleasant experience. Food and creativity was outstanding. Great restaurant. Food really excellent. Great personal service. Wonderful. warm environment with amazing flavors of fish, herbs and nuts in unique combinations. Expensive but worth every penny! Leaven offers a true dining experience! Choose from a 3, 5 or 7 course menu and then sit back and indulge yourself in the intimate space, knowledgeable and caring staff, and phenomenal foods. What a gem! Thanks to Trip Advisor for helping us find this special place! 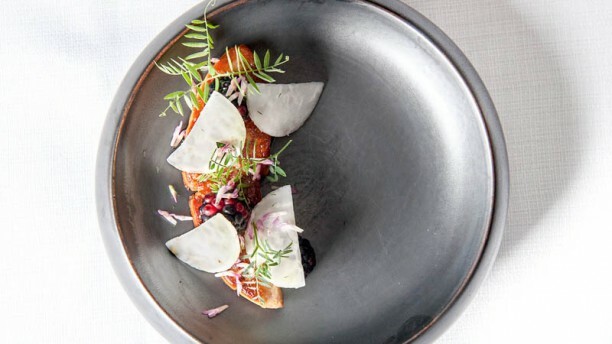 It’s hard to go wrong with food in Copenhagen. We took the 7 course tastorgaan menu and were Not dissapointed at all. Also the vegetarian dishes were excellent. Great staff too. It is a pleasure to read through your positive review. We do put genuine effort into creating the best possible set up for your evening. So when you full fill the frame work - we become very satisfied and uplifted. Thank you for taking your time to create this comment. We look forward to greet you again and wish you the best summer. The restaurant has only been open a bit more than a year, I understand. They must be making a good name for themselves. Dinner was outstanding and creative. Service was with a sincere smile. Convenient, attractive location near Nyhavn. A must do in Copenhagen! Amazing cruise and delightful service. Don’t miss it!